Frances Zellner (Brandt) came from Hungary to make the coastside her final home. The 22-year El Granada native died March 10, 2018, in her home, at age 86 following complications with heart disease. 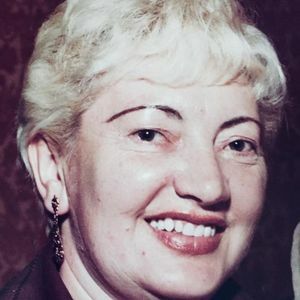 She was born in Hungary and married her sweetheart, Joseph Zellner, Jr. ("Joe") on October 14, 1950, who passed away in June 2001. They came to the United States in early 1959, joining many of Joe's family members who were already settled in Los Angeles. Frances worked for 10+ years for the family business, Zellner Plastering Co., as an accountant and administrative assistant. Frances decided to become a full-time mom to raise her daughter Franziska. In 1995, Frances and Joe followed her daughter and her family to El Granada where they continued to raise their grandsons, Daniel and Darren, who they loved so much. Daniel and Darren filled Frances' and Joe's lives which such tremendous joy and happiness. Frances was a very caring and giving woman, never thinking of herself. Her idea of a perfect day would be to spend it in its entirety with her grand-children, and subsequently, her great grand-children. She enjoyed going to church, sometimes 3 times a week, to meet up with her friends and to go out for donuts and coffee with them. She sure loved deserts, her favorite food. She also enjoyed working in the garden caring for her beautiful rose garden as well as cooking large meals for her loving family. Frances' greatest joy and pride was having her whole family come to Hungary where Frances and Joe got remarried in the same Church on their 50th wedding anniversary. Frances and Joe took great pride in showing off Franziska, Dennis, Daniel and Darren. "That was so special to her," her daughter said softly. "It meant a lot to Frances. Mrs. Zellner is survived by her daughter, Franziska Waul, and son-in-law Dennis Waul of El Granada, and grandsons Daniel, 34, and Darren Waul, 31 and her great grandchildren, Joseph and Dennise Waul, also of El Granada. A funeral Mass will be celebrated Friday afternoon, the 16th of March, for Mrs. Zellner at Our Lady of the Pillar Catholic Church in Half Moon Bay, followed by interment at Skylawn Memorial Park. In lieu of flowers, the family requests contributions to the American Heart Association. Add your thoughts, prayers or a condolence to Frances' guestbook.